The U.S. and Mexico have reached broad agreement on what they would like to see from a new NAFTA trading accord. The U.S. and Canada, to put it nicely, are still ‘sorting out some issues’. 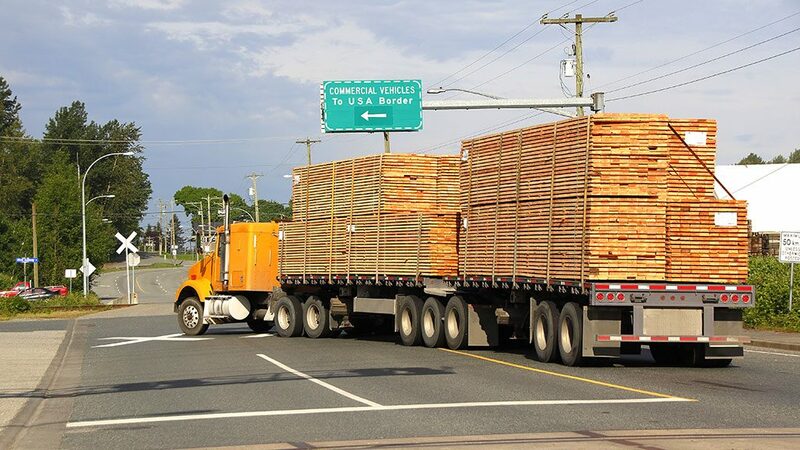 With back-and-forth trade relations between the two countries strained at present, Canada is dealing with tariffs already imposed on its softwood lumber exports to the U.S.; tariffs recently established on its steel and aluminum exports to the U.S.; and threatened tariffs on motor vehicle and parts exports. In response, Canada has imposed retaliatory tariffs, of equal magnitude, on steel and aluminum imports from the U.S. and there’s no telling what action the country might take if roadblocks are erected to cross-border auto sector shipments. The ten tables accompanying this article set out the past five-year histories of Canadian exports and imports in the four above-mentioned product areas, with a look at their combined totals as well. Worth keeping in mind is that approximately three-quarters of Canada’s total exports are sold into the U.S. market, while two-thirds of Canada’s imports are drawn from American sources. The top shaded lines in Tables 1A and 1B show that the annual dollar volume of Canadian lumber exports to the U.S. usually far exceeds the dollar volume of lumber imports from the U.S.
Table 1A establishes that about three-quarters of Canada’s total lumber exports are shipped to the U.S., but that exports of lumber to the U.S. as a percentage of total Canadian exports to the U.S. are a relatively modest 3%. On the flip side (Table 1B), lumber imports from the U.S. to Canada are traditionally less than 1.0% of total imports from the U.S to Canada. In other words, they play a miniscule role. Exports of lumber to the U.S.
Total of all ‘goods’ exports to the U.S.
Imports of lumber from the U.S.
Total of all ‘goods’ imports from the U.S.
HS* numbers are international foreign trade product designations. By far, the biggest sub-component of ‘lumber’ is ‘softwood lumber’. Data source: Innovation, Science & Economic Development Canada. The top shaded lines in Tables 2A and 2B reveal that Canada also holds a decided advantage in the trade of aluminum with the U.S., with exports exceeding imports by a factor of three. Almost all Canadian exports of aluminum (i.e., approaching 90%) are shipped to the U.S. But Canadian exports of aluminum to the U.S. as a percentage of all Canadian exports to the U.S. is a small figure, less than 3.0%. Aluminum imports into Canada from the U.S. as a percentage of total imports from the U.S. are a barely perceptible 1%. Exports of aluminum to the U.S.
Imports of aluminum from the U.S. The supply-chain balance between the two countries comes into better equilibrium in Tables 3A and 3B, for steel products. For the past three years, Canadian exports of steel to the U.S. have been a close match with steel imports from south of the border. But again, exports of steel to the U.S. as a percentage of total Canadian exports to the U.S. (Table 3A) are a not-hugely-significant 3.0%. Furthermore, while 85% of Canadian steel exports are sent to the U.S., Canada draws only a little more than half of its steel imports from the U.S. Canada satisfies more than 40% of its non-domestic steel demands through imports from countries other than the U.S.
Imports into Canada of steel from the U.S. as a percentage of total imports from the U.S. (Table 3B) are about 4%. For the three products considered so far, − lumber, aluminum and steel – exports to the U.S. as a percentage of total Canadian exports to the U.S. are just under 10% and imports from the U.S. as a percentage of total Canadian imports from the U.S. are only 6%. Just the same, those three products – lumber, steel and aluminum (e.g., in ductwork) are used extensively in construction and tariffs are going to drive up construction costs. Exports of steel to the U.S.
Imports of steel from the U.S.
What happens when autos and parts are added to the mix? From Table 4A, Canadian exports of autos and parts to the U.S. are over 90% of total Canadian exports of autos and parts. More important, at nearly 20%, they are a significant share of total Canadian exports to the U.S. Indeed, at between 13% and 15%, they are a significant share of Canada’s total exports to the world. As for Canadian imports of autos and parts from the U.S. (Table 4B), they are about two-thirds of total Canadian imports of autos and parts; about one-fifth of total Canadian imports from the U.S.; and about one-tenth of total Canadian imports from the world. Those are significantly high percentages. Exports of autos & parts to the U.S.
Imports of autos & parts from the U.S. Tables 5A and 5B combine the results for the four product areas – lumber, aluminum, steel and autos and parts. 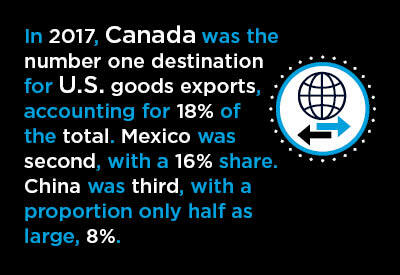 From Table 5A, ‘the four’ account for 27% of total Canadian exports to the U.S. and about 20% of all Canadian exports. On the import side (Table 5B), they make up about 27% of total Canadian imports from the U.S. and 14% of total Canadian imports from the world. Exports of ‘the four’ to the U.S.
Imports of ‘the four’ from the U.S.
Canada continues to have other major trade products to promote and appreciate, such as oil, natural gas, base metals and agricultural products. But having Canada-U.S. trade in lumber, aluminum, steel and perhaps even motor vehicles and parts in jeopardy is a serious matter. Some final comments (and statistics) on the importance of Canada as an export market for the U.S. are warranted. In 2017, Canada was the number one destination for U.S. goods exports, accounting for 18% of the total. Mexico was second, with a 16% share. China was third, with a proportion only half as large, 8%. In Europe, the United Kingdom and Germany were the prime customers of U.S. producers, but each was at only 4% of total U.S. goods exports.